Frank Frazetta is best known for his Conan covers, but Conan was not the only barbarian hero blessed by his brush. Above we see Brak the Barbarian, a blond pony-tailed Conan clone who first appeared in 1963’s Fantastic Stories of Imagination, a digest-sized pulp magazine. Jakes’s career began in the early 1950s, but Brak was his break-out character. Like many character clones, Jakes created Brak because no one was publishing the kind of stories Robert E. Howard used to write, so he decided to do it himself. Brak made his way from the digests to paperback books in the course of the 1960s, following many Brak reprints in the sword & sorcery anthologies of the day. These books were reprinted in the 1970s and 1980s, making the blond barbarian one of the most famous Conan clones in the fantasy business. The single Brak story I’ve read so far, “The Girl in the Gem,” stood out as one of the finer tales in L. Sprague de Camp’s anthology The Fantastic Swordsmen. I’m told that the novels are somewhat more difficult going. John Jakes is perhaps most notable not due to his genre fiction, but to his sprawling multi-generational Civil War-era historical romance The North and the South. The series was televised in the 1980s with such notable actors as Patrick Swayze and Star Trek’s Jonathan Frakes. 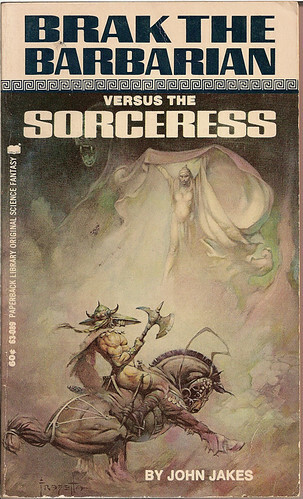 The success of the series (and the books that inspired it) further fueled the John Jakes publishing efforts, generating a “Best of” volume from DAW and assorted other reprints of Jakes’s fantasy and science fiction work. I’ve been slowly accumulating John Jakes books since I enjoyed “The Girl in the Gem,” and while I have not yet read any of them I plan to do so soon. John Jakes has graduated from “hack Conan pasticher” in my mind to an author capable of churning out very fun tales in the Robert E. Howard tradition. It remains to be seen whether I’ll be as smitten with the rest of his stuff as I was with “The Girl in the Gem,” but since his covers often feature excellent artwork from the likes of Frank Frazetta or Jeff Jones, I don’t plan to stop collecting them any time soon.